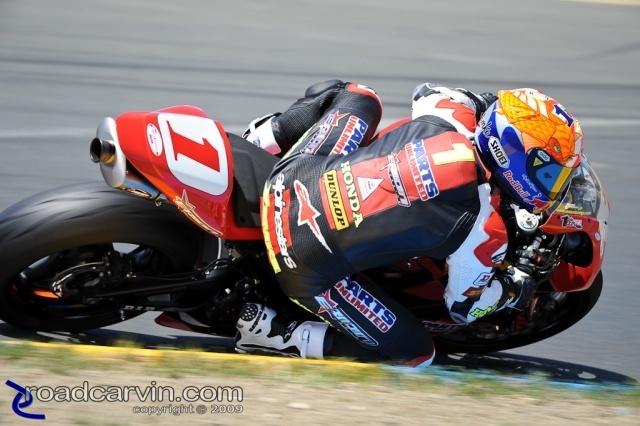 Jake Zemke riding the Erion Racing Honda CBR600RR. Submitted by Randy Jones on May 25, 2009 - 6:43pm. Photography has been my passion since the early 60's, starting with developing and printing my own B&W film. I purchased a Nikon TN35 in '68 and have been shooting Nikon ever since. Photography was not a priority when my children were growing up, then in the late 1980s I became a Season Ticket holder at Sears Point Raceway in Sonoma, Ca. I began to shoot at the track, all classes and types: Nascar, sports cars, motorcycles, and dragsters. In the mid 90s, I purchased a Nikon N-70 Film camera. After spending lots of money on 35mm film, I finally came to my senses and purchased a Nikon D-70 Digital Camera in the late 90s, which introduced me to a whole new world in photography and I am still improving my skills today. I currently shoot with a Nikon D-200 and Nikon D-700 with a Tamron 28/300 SC lens and a 200/500 Tamron Zoom.